Officers seize over 165,000 litres alleged scammers planned to sell as renowned Brunello. Italian police foiled an attempted scam aimed at passing off over 165,000 litres of cheap red wine as one of the country’s most famous, which usually sells for between €35 and €500 a bottle. 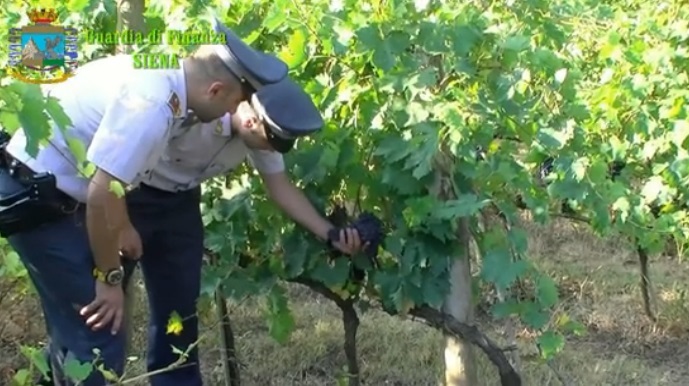 Finance police recently blocked the intended “sting” and sequestered 165,457 litres of red wine stored in canteens around Siena,Tuscany after they were tipped off by the Brunello di Montalcino producers consortium. They estimate that the whole sting could have earned up to €5 million. The scam in this case was simple enough. First, buy large quantities of cheap red wine from producers. Secondly, forge the label of one of Italy’s most famous wines, namely Brunello di Montalcino, produced around Siena. Thirdly, put the forged labels onto bottles containing the cheap plonk. Obviously, of course, you sell the “plonk” at Brunello di Montalcino prices – ranging from €35 to €500 euro per bottle — in the process making a tidy profit given that 160,000 litres equals 220,000 bottles. On occasion, individual Brunellos sell for up to $50,000. The US market remains vital for Brunello since one in every four bottles of this prestigious wine is sold in America.